You can pan fry it, poach it, roast it, grill it, wrap it in parchment paper or tuck it inside a square of puff pastry. Then, there is another way to prepare fresh salmon. That is, seared to a beautiful golden brown and then finished off in rich, flavorful Tuscan Butter Sauce with cherry tomatoes, basil, and fresh garlic. If you really want to get fancy, add a few jumbo shrimp to the mix and you have a delicious twist on a dinner favorite. (You’ll be serving one piece of salmon and 3 jumbo shrimp per serving.) This recipe is as easy as it gets, but there are always questions about how long to cook salmon. With this recipe you’ll be searing it first and then letting it continue to cook in the butter sauce for a few minutes. The USDA recommends cooking salmon to an internal temperature of 145 degrees, but some (many chefs and America’s Test Kitchen included) find that 145 degrees renders the salmon overcooked and prefer an internal temperature of 125-130 degrees. A good general rule of thumb is to cook salmon until the center is translucent but will still flake when you put a fork to it. I love this recipe because not only do you get a really flavorful piece of salmon (and shrimp), but you also get a gorgeously rich and creamy sauce that goes beautifully next to a bed of rice or a big piece of crusty bread to scoop up “pan goodness.” Watch my How To Video for Tuscan Butter Salmon here! In a large skillet over medium-high heat, heat oil. Pat salmon dry and season all over with salt and pepper. Add salmon skin side up and cook until golden brown, about 6 minutes. With a spatula, flip salmon over and cook 2 minutes more. (When salmon is done, you can leave the skin on or remove. )Transfer cooked salmon to a plate. Add shrimp to the skillet and cook until pink, about 3 minutes. Remove shrimp to the plate. Add butter to the hot skillet. When butter has melted, stir in garlic and cook for 1 minute. Add cherry tomatoes and basil, stirring to combine. Add half and half and Parmesan and stir well. Simmer for 2-3 minutes or until sauce thickens. 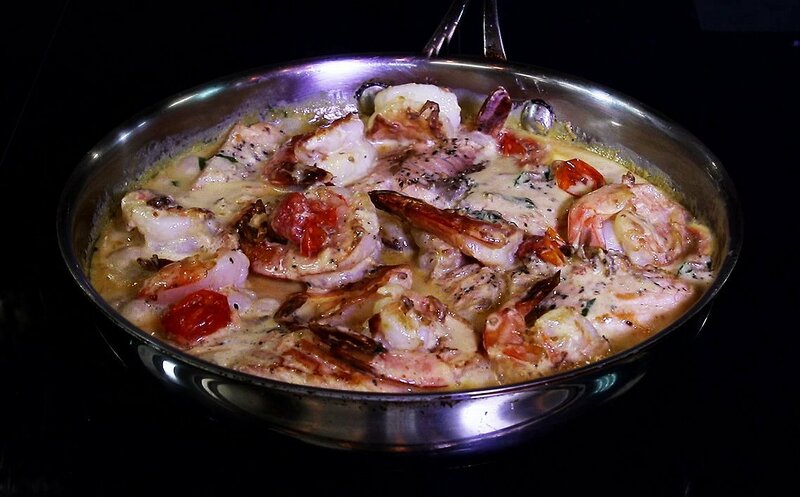 Return salmon and shrimp back to skillet and spoon sauce over the top of fish. Simmer for 2-3 minutes more. Garnish with more herbs and lemon wedges. Serve with rice if desired.